A meek comedy, Seems Like Old Times attempts to recreate the screwball vibe of the 1930s and 1940s but falls flat. Author Nick Gardenia (Chevy Chase) is abducted from an isolated cabin overlooking Big Sur by two goons, and forced to rob a bank in Carmel. Now a wanted man, Nick escapes his captors and makes his way to the house of his ex-wife Glenda Parks (Goldie Hawn), a kind hearted defence attorney. 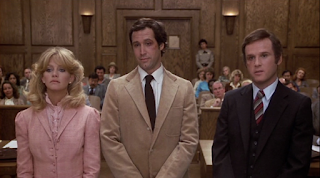 She is now married to district attorney Ira (Charles Grodin), who has been tapped by the Governor to be the next state attorney general. Nick appeals to Glenda for help, and also starts to try and win her heart back. In a series of increasingly frantic episodes she keeps him hidden from Ira, who starts to become suspicious as his wife's behaviour grows more erratic. Written for the screen by Neil Simon and directed by Jay Sandrich, Seems Like Old Times is repetitive, boring and homebound. Although a few good laughs are delivered in isolation, the film runs out of ideas and energy by about the 20 minute mark when Nick arrives at Glenda's house. What follows is 80 minutes of contrived set-pieces consisting of Nick hiding, Glenda covering for him and Ira seething. Simon's material normally contains a reliable level of quality, but not here. The dearth of ideas is sometimes shocking, as evidenced by repeating the hide-under-the-bed trick, as well as as the gate-crash-the-party episode. For a simple short duration comedy to recycle its own already feeble jokes is inexcusable. Sandrich spent his directing career in television, and this was his only cinematic outing. The film has all the imagination of a sitcom, with most of the action confined to the Parks house and cheap props like the gaggle of dogs and criminal employees overused and then dropped when it's time to wrap things up. 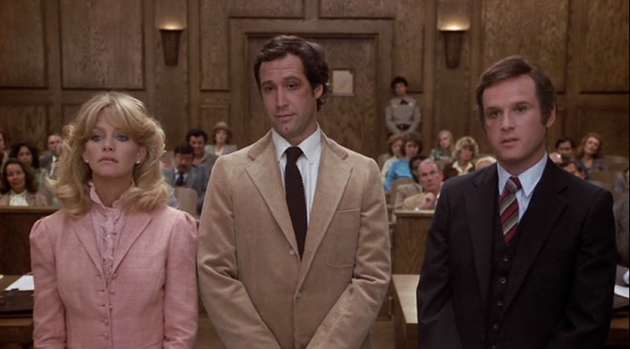 Chevy Chase delivers his usual smug-but-stupid persona while Hawn often resorts to wide-eyed hysteria. Grodin emerges with some credit as the straightman husband running out of patience with his far from convincing wife. Seems Like Old Times carries the double meaning of rekindling Nick and Glenda's spark and recalling the glory days of screwball comedies, but on both counts fails to deliver good times.